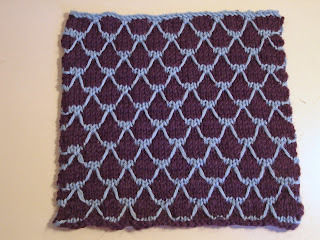 Here are photos of two more slip stitch squares from the Learn to Knit Afghan. I think I have two more to go in this section. 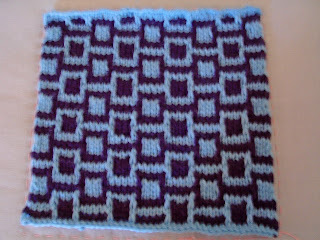 This top square looks nice, but it is that type of slip stitch that I don't like in reality. It has strands of yarn laying across a differently-colored surface. I think that if this were in a garment the loose strands would catch on things. I know they would if I wore it because I'm kind of clumsy. I even worry about it being in a blanket. To me, this design is just not practical. The bottom square doesn't photograph well at all. It looks like the surface is choked with fiber here, and it looks worse in the black and white photo in the book. In person however, this has a surprising appeal to me. It has a jaunty look, especially viewed at an angle. I think it would make a nice hat or headband. Now imagine my delight when I visited Popknits and saw this sweater: It's perfect. It even gets around the wavy buttonhole issue by using a zipper, which fits the style of the jacket perfectly. 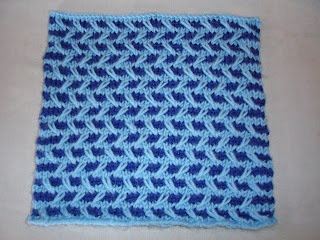 What a great use of a great stitch pattern! Here is the link for Popknits if you haven't seen it. It is a free knitting web-zine featuring original, vintage-inspired knitwear, which is just the kind I like best. Thanks for the link to Popknits. 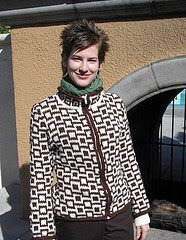 I had never seen it before, and it looks like a great site for free patterns. It's your fault that I ordered that book, along with too many others. Thanks (I think).